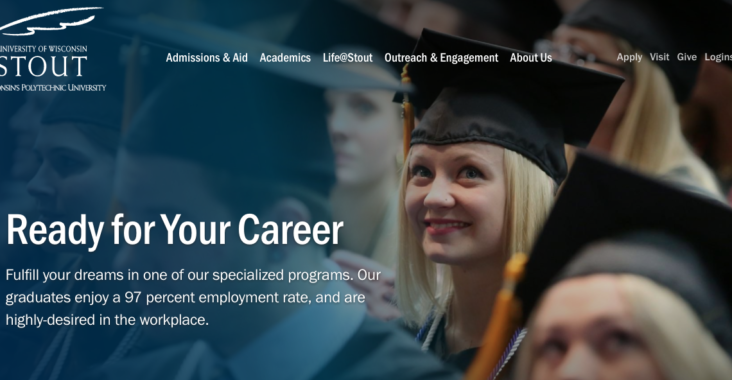 The University of Wisconsin–Stout has recently launched its new website in both desktop and mobile formats. The first part of the new website went live on Jan. 23, and more pages have been steadily updating ever since. The Web Oversight Committee explained in an email to students and staff that the website is being launched in three phases. According to the email, the site is being launched in phases because “[the UW–Stout website] has more than 10,000 pages to migrate.” The first phase was what was launched on Jan. 23, and launch dates for phases two and three have not been announced yet. Currently, any links that have not been migrated onto the new site, specifically for certain departments or majors, will link back to UW–Stout’s old website. At first glance, it looks like the site caters more towards current high school juniors and seniors that are considering the university and incoming freshmen. However, everything current students need is also housed on the site, although things may have moved. Pages that most students will frequently access, like the logins page and housing gateway, were part of the first phase update and are correctly linked on the new site. The changes on the website are, overall, cosmetic. In the email previously mentioned from the Web Oversight Committee, they stated that they feel the campus will find the new website “much more appealing, useful and engaging.” The website is a cumulation of two years of work so far. Bailey is also an RA on campus, and she shared that she recently struggled with finding the page on the new website with instructions for how to connect her RA printer to her laptop. It took her over an hour to find the page she was looking for, and she said it took “an awful lot of digging” for something she found quickly on the old website. If you have any praise, critique or general feedback for the web design team, the UW–Stout website has a “site feedback” button that is always in the lower right of the screen. If you’d like to share your thoughts, you may voice them there.